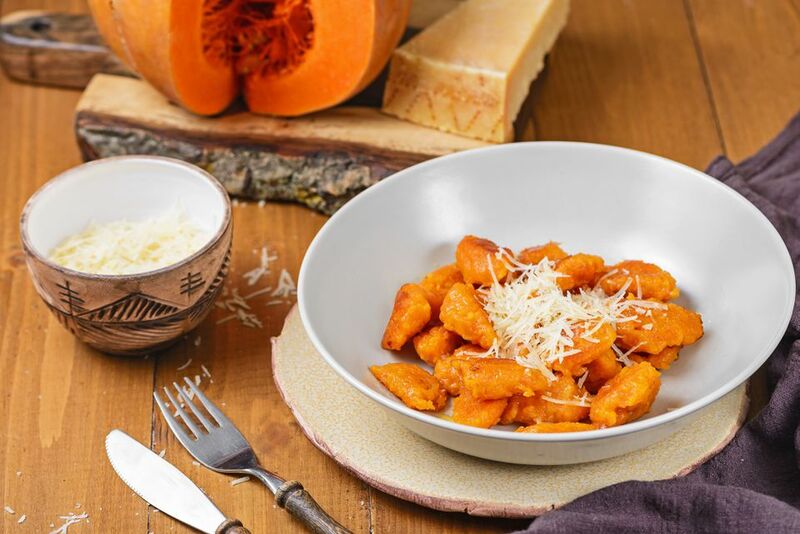 Pumpkin-filled dumplings are a fun and unique recipe to serve as a Halloween party appetizer, as a vegetarian Thanksgiving entree, or as a fall dinner. Use fresh steamed or canned pumpkin puree for these vegetarian and vegan dumplings or go for a completely different squash all together. Add a sprinkle of cheese or use a vegan soy cheese and vegan margarine to keep this recipe vegan. In a large bowl, whisk together the pumpkin, egg replacer, salt, nutmeg, and baking powder. Slowly add the flour to form a soft dough. Bring a large pot of water to a boil and add a bit of salt. With a wet spoon, carefully drop a teaspoon of the dough into the boiling water. Continue dropping teaspoons of dough into the water. Allow dumplings to boil for 10 to 12 minutes. Remove from water and drain in a colander or on paper towels. In a large skillet over medium heat, melt the margarine. Saute the dumplings for 7 to 10 minutes, or until lightly browned. Sprinkle with Parmesan cheese or a vegan cheese substitute, if desired, and serve hot.